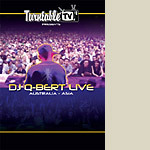 A collection of shows during Q-Bert's Turntable TV Tour in Asia and Australia. Plenty of intense show footage and hilarious behind-the-scenes action. Plus a segment with Addie Chang, along with footage from some of the east hemisphere's finest. Watch Q-Bert tear it up on the extraordinary QFO, designed by Q himself!